At the end this year, do as Barney and Horseface have done, and mend some fences. I don't recommend doing it over the alcohol that they've clearly been consuming, because, as you can see, it leads to more problems than it solves. Just try to leave this year on the best note you can, so that the next year can begin on a good one, too. This strip apparently comes right in the middle of some kind of storyline involving the Earl of Juniper, but no storyline could keep Oaky Doaks from wishing everyone a happy new year. He is quite incorrect about nothing happening in 1936, though. 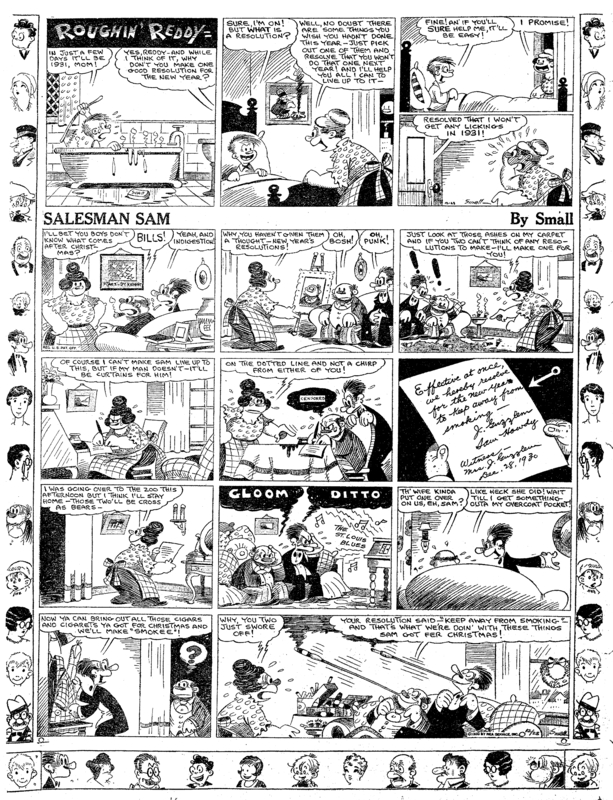 The year saw the death of Grace Drayton, the cartoonist behind the adorable The Pussycat Princess, the end of George Swanson's venerable Salesman Sam strip and E.C. Segars O.G. Wotasnozzle, and the first appearance of the great comic strip superhero The Phantom. Oaky's mind might just be mixed up, though, given that somehow he lives simultaneously in medieval times and in the 1930s. It can mess with your concept of time, for sure. Here's a new year's wish from Oaky Doaks and King Cedric. Oaky Doaks was a strip drawn by Ralph Fuller, whose art I quite like, despite the king's insistence that he can't draw (and the poor quality of this scan). Oaky was a medieval knight who was never formally knighted, and who made his armor out of a tin roof. Here we see them relaxing on a rock after most likely losing Oaky's horse, Nellie. I wonder why the king doesn't get any fan mail, though, being that he is the king. You'd think he could get some kind of royal scribe to write him some fake ones, at least. Here's a Salesman Sam left over from last year, with bonus Roughin' Reddy topper. Here we have two different ideas about New Year's Resolutions. Reddy's decided to make one that is vague and possibly achievable, but that if he fails to keep he can blame someone else for. Sam and Mr. Guzzlem, on the other hand, prefer to keep theirs by interpreting the meaning of the resolution in a way it wasn't intended. I'm not sure which one would be more effective. Reddy's method would probably take less work, but Sam's method would give him more of an opportunity to gloat. Neither of them seem very safe, though. I imagine they'll both end up with some kind of physical injury. This strip doesn't mention Christmas at all, which is odd, given how many Arthurian legends take place on Christmas. Still, it seems like it ought to be Christmas, what with it being winter, and family coming together and all, and the fact that it was published on December 25. 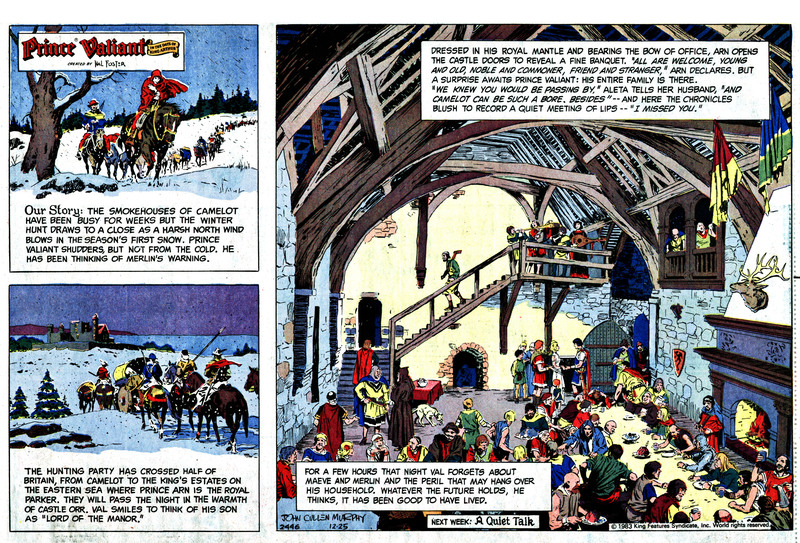 I've always liked Prince Valiant, and though this artwork isn't as good as the original artist Hal Foster's, John Cullen Murphy still does a fine job.